Infection of the Outer ear, “Otitis Externa”, is the most common type of ear infection and one of the most common diseases of dogs! Otitis externa is like “swimmer’s ear” in people. This condition is actually MORE painful than middle ear infection! Although any dog can get an ear infection, breeds that have pendulous ears, like Cocker Spaniels and Basset Hounds or those with hairy inner ear flaps, like Miniature Poodles and Schnauzers, have more frequent ear infections. Because a number of problems can cause an ear infection, it is important that your dog or cat see the veterinarian at the first sign of symptoms. The veterinarian will also make sure the eardrum is intact before prescribing medication because some medications have been known to result in hearing loss if administered to a pet with a ruptured eardrum. Your veterinarian will prescribe proper medication and treatment. Examining the ear–Your veterinarian will use an otoscope to look inside your pet’s ear for debris and to check on the condition of the eardrum. If this is painful, your pet may need to be sedated or anesthetized for the exam. 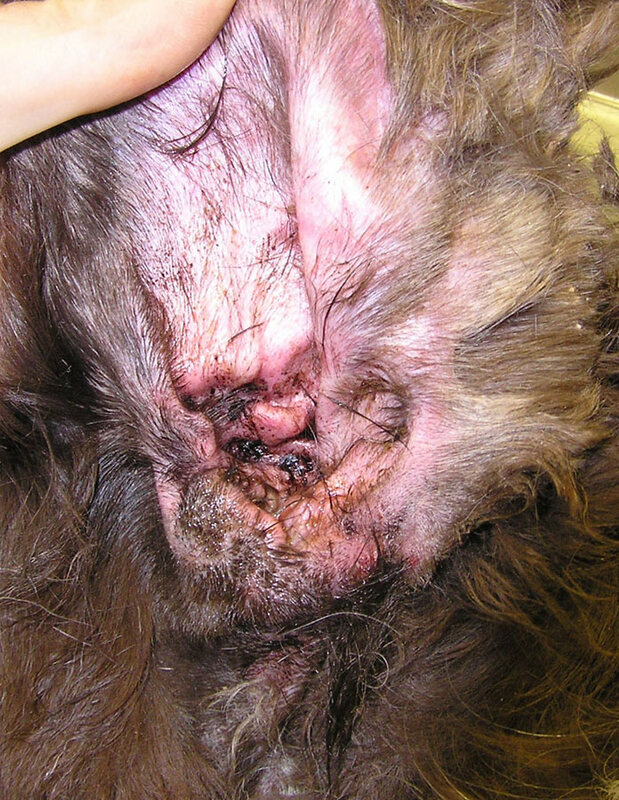 If the ear examination reveals a foreign body, tick or heavy debris buildup, sedation may also be required in order for the veterinarian to remove the irritant. 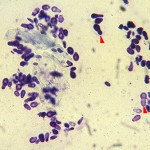 Cytology– Your veterinarian will take a sample of the material in the ear canal and examine it under a microscope (cytology) to determine if an organism caused the infection, and which organisms are involoved. This is a critical step of diagnosis and follow up! Different organisms require different medications and the type of organism involved can change over time, even during treatment! 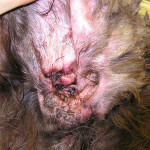 Cleaning- Your veterinarian may need to clean your pet’s ear of debris in order for treatment to be most effective. 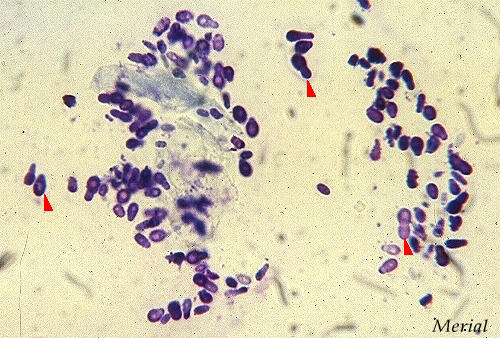 Some medications are inactivated in the presence of pus. Medication can not treat an infection if there is so much debris in the canal that the medication can not reach the skin. Cleaning can sometimes be done in the exam room. But anesthesia is needed if your pet’s ear is too painful or there is an excessive amount of debris. Making the investment in cleaning, even if it means anesthesia, early in the treatment process will help cure the infection faster and reduce the number of rechecks needed. Medication treatment–Medication treatment is typically prescribed for one to two weeks. This can be painful for your pet, so be gentle. Your veterianrian may be able to instill long-acting medication in your pet’s ears initially to minimize uncomfortable treatments at home. Depending on your pet’s condition, you may have to do daily cleaning at home. Your veterinary team will show you how. The cause of infection can change during the course of treatment– from a bacterial to a yeast infection, for instance. Important warning–The longer an ear infection goes untreated, the harder it is to get rid of. Your pet will be in pain until you start treatment. Heavy head shaking, a sign of infection, can result in broken blood vessels that require surgery (this is commonly called an aural hematoma). Frequent ear infections can damage the eardrum and close the ear canal, in which case surgical reconstruction may be necessary. Recurrence of infection may happen for a number of reasons. Sometimes the infection is persisting rather than recurring because it was not cured the first time. This happens most often when patients are not rechecked with the veterinarian. An infection may look cleared at the ear opening, but still be brewing deep in the canal, near the ear drum. #1 Allergies – inhaled allergies (atopy) or Food allergies! Sometimes recurrent ear infection is the ONLY sign of food allergies. Ask your vet if this might be an issue with your pet. Use any ear flush prescribed for your veterinarian on a regular schedule. Getting lazy and forgetting will often lead to recurrences!